← Are Xtracycles taking over in your part of the country? October is International Walk to School Month. Walk and Wheel Month is part of an international movement to encourage active transportation to school. Kids are encouraged to use any type of human–powered mode of transport (feet, scooters, bikes) to get to school. My friend, Leslie and I are leading the effort at our local elementary school. We were so inspired by the success of Bike to School Month last spring, we thought we’d encourage more kids to join us this fall. Cascade Bicycle Club sponsors the program locally, giving prizes to kids who make at least seven car-less trips to school in October. Is any one out there leading a walk, bike or scooter–to–school effort this October? It’s not too late to get something organized. I’d love to hear what you’re doing to promote it. This entry was posted in alternative transportation, bigger than here, bikes, kids, neighborhoods, sustainability and tagged alternative transportation, bike, bike-to-school, kids, scooter, walk. Bookmark the permalink. My daughter’s pre/grade school consistently has one bike locked up out front. One. On Wednesday I picked her up (by bike, of course) and the line of cars was long and sick. Why? It’s on a hill. On Monday as I crested the hill carrying both girls on the X, a guy asked me with utter disbelief if I just rode up the hill. I admit I find it very disheartening to experience the average person’s inability to see themselves engaging in such behavior. Thankfully we don’t really need to- about 90% of children walk here anyway. I’ll see if the school is interested though. I am trying to get my Son’s school to celebrate this and install a bike rack. I would also like to convince then to establish a car-free zone around the school. lavanna, It’s so great that your daughter gets around on a bike – maybe there is some hope after all. smudgemo – Our school is at the top of a hill too (although probably not as steep as yours). If my kids can ride up hills, I bet any one could if they wanted to! andy – I dream that some day 90% (I’d even take 50%) of kids in the US will walk to school. 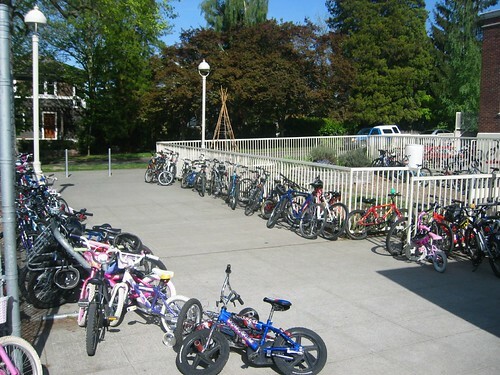 Devin – I just found out the bike rack I’ve been asking for since last year has been approved by the PTSA. Keep trying. Let me know if you’re successful in establishing a car-free zone around the school. A group of us are also working on that issue at our school.